President Cyril Ramaphosa had changed the perception of South Africa in a positive direction after he was elected to the nation’s highest office. There was “positivity” in the country and international investors started to bite again. “But I began to panic when I heard he was a recipient of Bosasa golden handshakes. Imagine if something serious were to happen… if he doesn’t handle the Bosasa issue properly. Who will lead from the ANC side (if he was no longer around)? People were calling for those who had received funds from this company to get the chop. While it appeared that Ramaphosa was willing to answer questions from the Public Protector over the matter, it was clear he was one of the company’s recipients of largesse. “There is too much spin doctoring,” said Holomisa, who said Ramaphosa should answer to parliament on the matter. South Arica needed an “indaba” for education so the country could thrash out a skills-building curriculum. Holomisa said that under Paramount Chief Kaiser Matanzima, the former Transkei homeland chief, education in this territory had been of a high standard. Black children from elsewhere were sent to schools and university there. The Eastern Cape had once been “the fountain of education” but was today “struggling”. 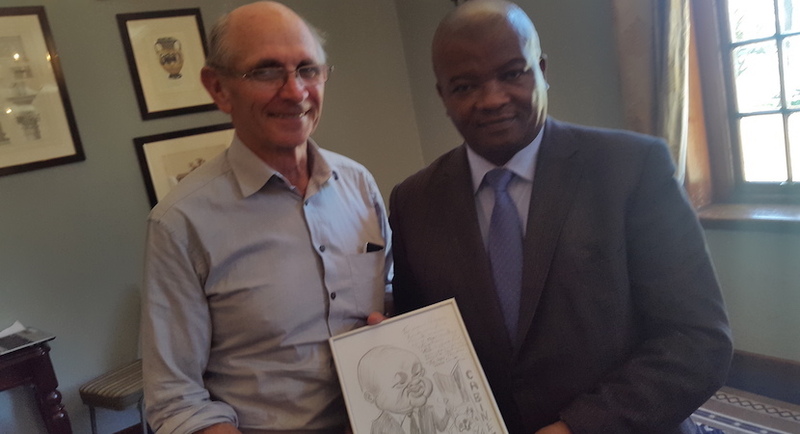 Asked why voters should vote for the UDM – described by SA Local Government Research Centre director Clive Keegan as “a party of Holomisa and (newly installed Nelson Mandela Bay mayor) Mr (Mongameli) Bobani, Holomisa said that a party should not be individualised. His party had a track record of fighting corruption. It had focused on dodgy deals carried out by the Public Investment Corporation. This had led to the resignation of its chief executive officer Dan Matjila. It had exposed wrongdoing at the Independent Electoral Commission – hence its chief Pansy Tlakula had been removed. Former Nelson Mandela Bay mayor Athol Trollip had accused Bobani of corruption, but he had never presented evidence of this before the full council of Port Elizabeth or carried out the due processes of proving his case against Bobani. Thus the UDM was now working with the ANC and other opposition parties in the council. He said the Democratic Alliance – which ruled the city for two years until Trollip was toppled – could not dictate to the UDM. “We were told by Trollip that Bobani is corrupt. We said: Mr Trollip please from the UDM’s point of view go and investigate Bobani. Once you find anything (amiss) you don’t have to come to us. Table those findings … in the (city) council. Let Bobani go through the processes (and) appear at the ethics committee. Once the council takes a decision to say… he has done something wrong, then the party (the UDM) can act. We are not going to take instructions from you (the DA). We are never going to take instructions from the DA or for that matter any other party.” Bobani has ruled Nelson Mandela Bay with the ANC since last September when Trollip’s administration fell. Pressed on coalition building after the next election expected in May, he said that there was no pre-election agreement. “A party which has more seats (asks) so-and-so can you help us… we have an open mind…. We have worked with the ANC in KwaZulu-Natal in 2004 …. We are working with the ANC in Port Elizabeth. We work with anybody.” He said that the ANC/UDM alliance in Nelson Mandela Bay had been described as a “coalition of the corrupt” by the DA, but that self-same party was hypocritical as it had itself dismissed its Cape Town mayor Patricia de Lille on charges of corruption. “Hypocrisy sometimes needs to be exposed for what it is,” he said. Asked if he would agree with the description that the UDM had similar policies to the ANC but merely opposed corruption and cadre deployment, he said that was a correct assessment. He agreed that legislation should be put in place to expropriate land without compensation. This should apply to state and private land. This could include unused farms next to squatter townships, he said. He said the economy was still skewed in the favour of the urban elite. “If you want to start your own business in a rural area… you need access to the internet, water and electricity. That is the responsibility of the government.” There was plenty of money in the country but much of it had been wasted on arms deals and corruption. Donwald Pressly is chair of the Cape Town Press Club.